See you at the 2015 Greek Indepence Day Parade in New York City on Sunday, March 29th, 2015. The Parade starts at 1:30 PM and runs from on 5th Aveneue from 59th Street to 79th Street. We will be in the 1st Battalion in front of the Miss Greek Indepence Day Float. See you there! Click on the Thumbnail photos below to expand them for a closer look. These are pictures taken by parade watchers and the news media. Enjoy them, and we'll see you in the 2014 Greek Independence Day Parade in NYC! The Greek Warriors - The premier Greek Hoplite living history group in the <?xml:namespace prefix = st1 ns = "urn:schemas-microsoft-com:office:smarttags" />New York area! Welcome to our website. The Greek Warriors is a dedicated living history group, recreating the ancient Greek Hoplite Warrior. Our arms an armor portray the classic Greek Warrior in full panoply. Check the "About Us" page to find out more about The Greek Warriors, and where to see us next. 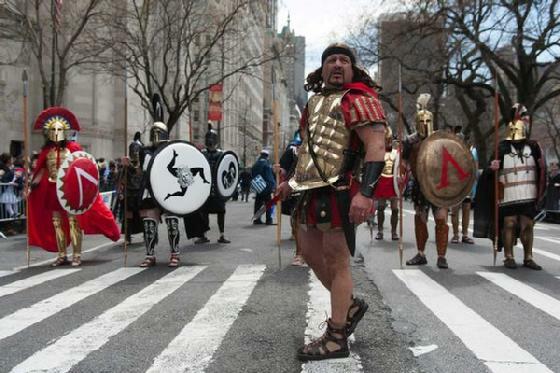 The Greek Warriors in the 2009 Greek Independence Day Parade in New York City. The 2015 season is is here, I would like to thank everyone who has helped to make our group a possibility. I would like to also thank everyone who has had The Greek Warriors come to one of their events. I would also like to thank The Hellenic Federation of Greater New York for having us in The Greek Independence Day Parade in New York City this year. We will see you for the 2015 parade in New York City. Thanks again to all the troops and their families for their hard work and dedication this year. Thank you to the new members who joined our ranks this year as well. My thanks to my family for always being there, and thanks again to The Greek Warriors, the finest of Hoplites. I look forward to the rest of our 2015 season! All photographs and texts are the property of The Greek Warriors and are protected by copyright laws. Any use of the images and text for profit use without permission is strictly forbidden. Please contact The Greek Warriors for permission to use any images and text other than promotion of this group or for personal enjoyment or non-profit use. Any questions about this, just contact us.